Morrison Remick Waite (November 29, 1816 – 1888) was Chief Justice of the United States from 1874 to his death on March 23, 1888. 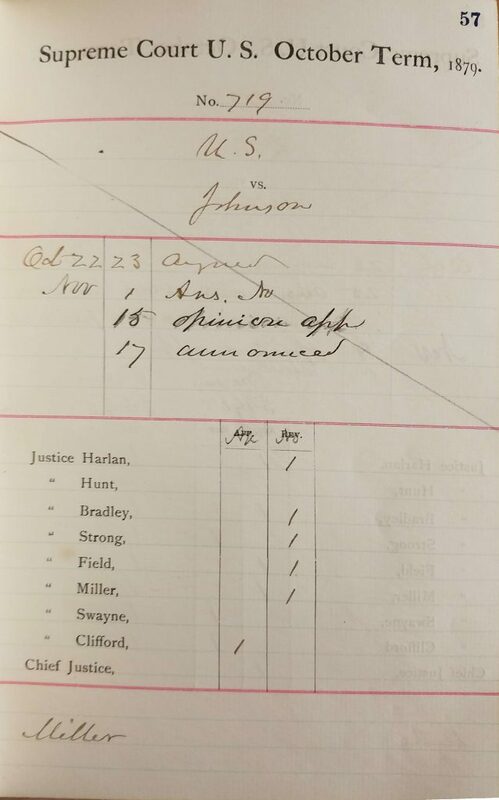 The US Supreme Court was at peak overload of its docket at the time, with the hundreds of cases per term leading to a four-year wait before cases were heard, something only exacerbated by the time spend by the Justices as trial judges riding circuit. 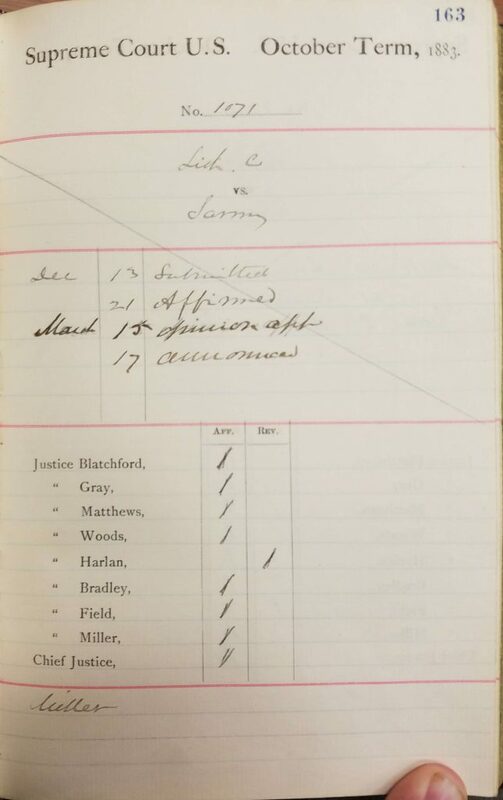 After Chief Justice Waite died, reportedly of overwork, his meticulous records would find their way to the Manuscript Division of the Library of Congress, Among these records were his docket books, which record every Justice’s vote at conference, after hearing and considering the arguments made in a case. Perris v. Hexamer, 99 U.S. 674 (1878) (Holding that a map of Philadelphia that had the same colors and legend for purposes of fire insurance risk as a map of New York did not infringe the copyright in the map of New York.). My history of this case is here. Baker v. Selden, 101 U.S. 99 (1879) (Holding that a book of blank ledgers and less than a page of prefatory material which was not copied had not been infringed by a book that did not copy the ledgers verbatim but rather allegedly copied the system embodied in the ledgers, and further holding that a book of blank ledgers could not be copied regardless.) Pam Samuelson’s history of this case is here. The Trade-Mark Cases, 100 U.S. 82 (1879) (actually 3 consolidated cases) (Holding the 1870 and 1876 Trademark Acts unconstitutional because they were not limited to interstate/international commerce, and could not be justified under the IP Clause of the Constitution because a trademark is not necessarily a “writing” or “invention.”). My history of this case is here. Burrow-Giles Lithographic Co. v. Sarony, 111 U.S. 53 (1884) (Holding that a carefully staged photograph of Oscar Wilde constituted a “writing” of an “author” to a sufficient degree that legislation to protect the photograph with copyright was constitutional.). There is a story about this case here. As can be seen from the published decisions, no dissent was recorded in the published opinion. 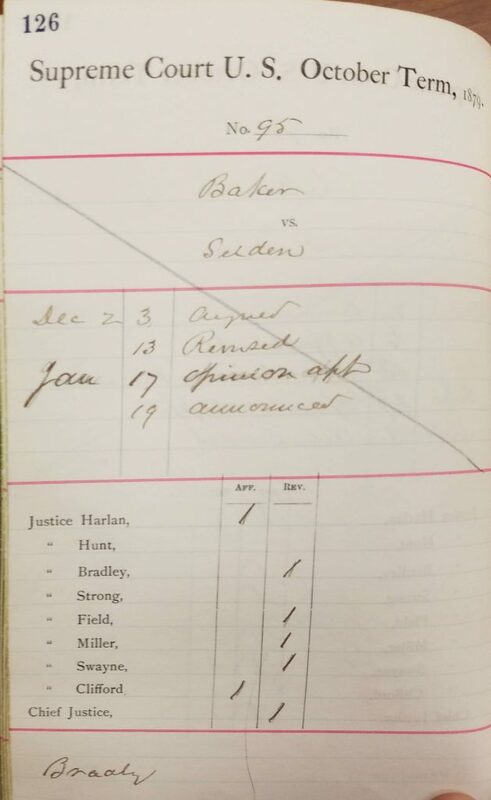 But at the initial conference, held shortly after the oral argument to vote on the outcome of the case, things were not so unanimous.1 Justice Clifford would have voted in a contrary manner in both the Trade-Mark Cases and in Baker v. Selden, while Justice Harlan would have voted in a contrary manner in Baker v. Selden and in Burrow-Giles v. Sarony. 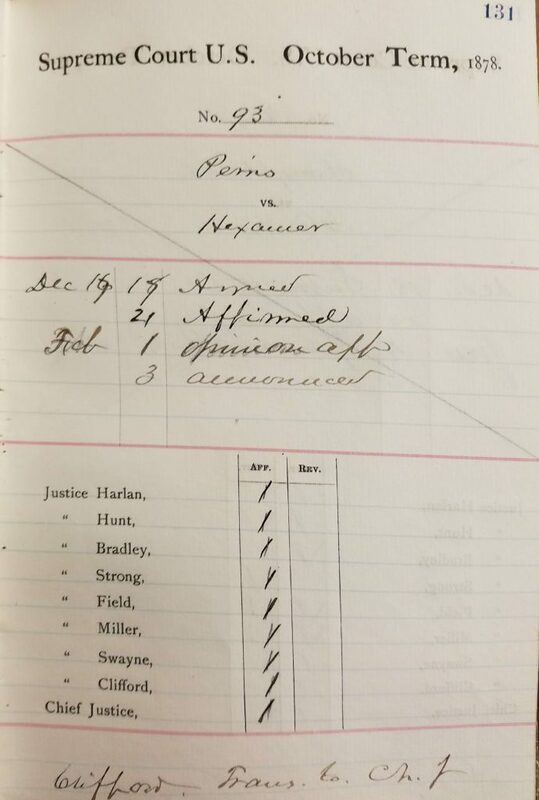 Perris v. Hexamer was unanimous at conference, but for some reason Justice Clifford was unable to produce an opinion, and instead the Chief Justice had to produce the brief opinion that was published in that case. Regarding Justice Clifford, the views in both cases seem to point to a liberal construction of the meaning of authorship and the Constitution’s copyright clause. It is of course possible that the reasons are different, but the rulings in both cases concerned the scope of what copyright can and cannot protect under the Constitution, and the common ground of both decisions is a conservative view of that power. 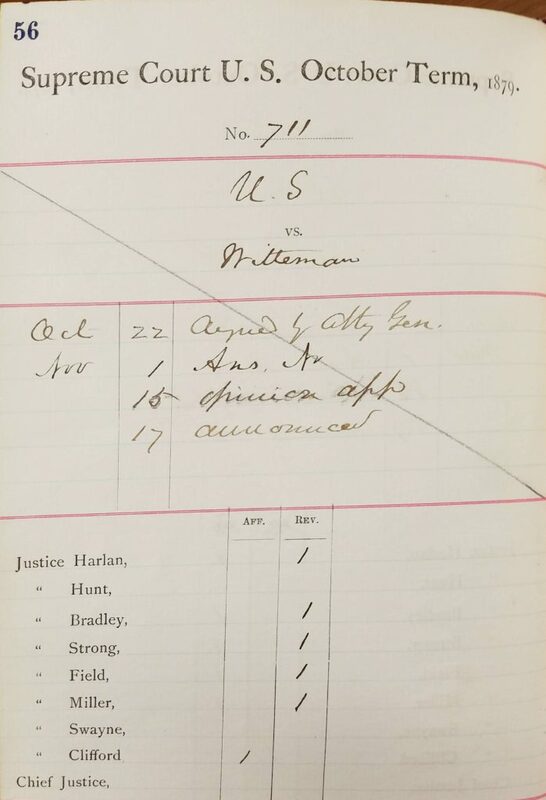 Interestingly, Justice Harlan joined Justice Clifford in how he would have held in Baker v. Selden, but would have dissented in Burrow-Giles v. Sarony, and held that photographs cannot be protected by copyright under the Constitution. Some have argued that these decisions where no dissent is recorded represent vote changes, but I believe it is much more likely that they simply represent silent acquiescence with the result of the vote at conference. 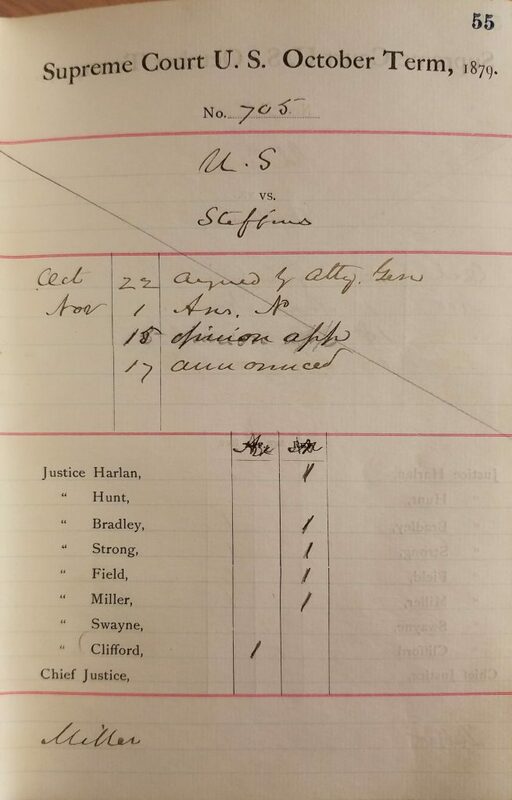 Scholars have noted that silent acquiescence continues to be common for the Supreme Court, especially in cases that are considered less critical, and it was surely even more common in the 1870s and 1880s, where judicial resources were stretched extremely thin. The clause of the Constitution giving Congress power to promote the progress of science and useful arts, by securing for limited terms to authors and inventors the exclusive right to their respective works and discoveries, does not, as I think, embrace a mere advertisement of a circus. Personality always contains something unique. It expresses its singularity even in handwriting, and a very modest grade of art has in it something irreducible, which is one man’s alone. That something he may copyright unless there is a restriction in the words of the act. [W]hile the word writings may be liberally construed…it is only such as are original, and are founded in the creative powers of the mind. The writings which are to be protected are the fruits of intellectual labor, embodied in the form of books, prints, engravings, and the like. [N]o one would now claim that the word “writing” in this clause of the Constitution, though the only word used as to subjects in regard to which authors are to be secured, is limited to the actual script of the author, and excludes books and all other printed matter. By writings in that clause is meant the literary productions of those authors, and Congress very properly has declared these to include all forms of writing, printing, engravings, etchings, etc., by which the ideas in the mind of the author are given visible expression. In other words, copyright was seen as protecting works of creativity, regardless of medium, but excluding works like simple trademarks (in the Trade-Mark Cases one of the relevant marks was a whisky bottle with the wording “O.K.” on its label. Previous Previous post: Opinions of the US Supreme Court – Does Word Count Correlate to Citations?